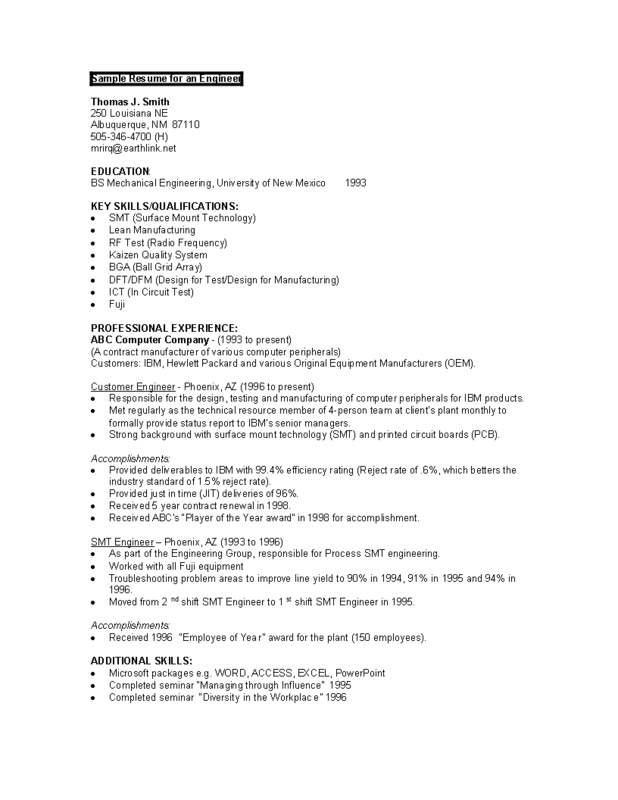 How to draft a Sample Computer Engineering Student Resume that will impress? How to grab your futures employers’ attention when you are applying for a new IT job? Download this Sample Computer Engineering Student Resume template now! This Sample IT Engineering Student Resume template will grab your future employer its attention. After downloading and filling in the blanks, you can customize every detail and appearance of your resume and finish. Completing your Sample Computer Engineering Student Resume has never been easier, and will be finished within in minutes... Download it now! EDUCATION: BS Mechanical Engineering, University KEY SKILLS/QUALIFICATIONS: SMT (Surface Mount Technology) Lean Manufacturing RF Test (Radio Frequency) Kaizen Quality System BGA (Ball Grid Array) DFT/DFM (Design for Test/Design for Manufacturing) ICT (In Circuit Test) Fuji PROFESSIONAL EXPERIENCE: ABC Computer Company - present) (A contract manufacturer of various computer peripherals) Customers: IBM, Hewlett Packard and various Original Equipment Manufacturers (OEM)..